I am often stumped by this simple question – how are you? I have to stop and actually think about how I am doing before I answer. I used to answer a quick, “fine and you?” But I can no longer do this with integrity. When someone takes the time to ask me this question I want to give them an honest answer. It’s just lately finding an honest answer that glorifies God and doesn’t draw unnecessary attention to me and my trouble takes thoughtful consideration. But when a friend, or my husband asks me this question, I must give them an honest answer because I know they really want to know. And the only way for them to know is for me to tell them. They can’t read my mind, although I act at times as if they can. 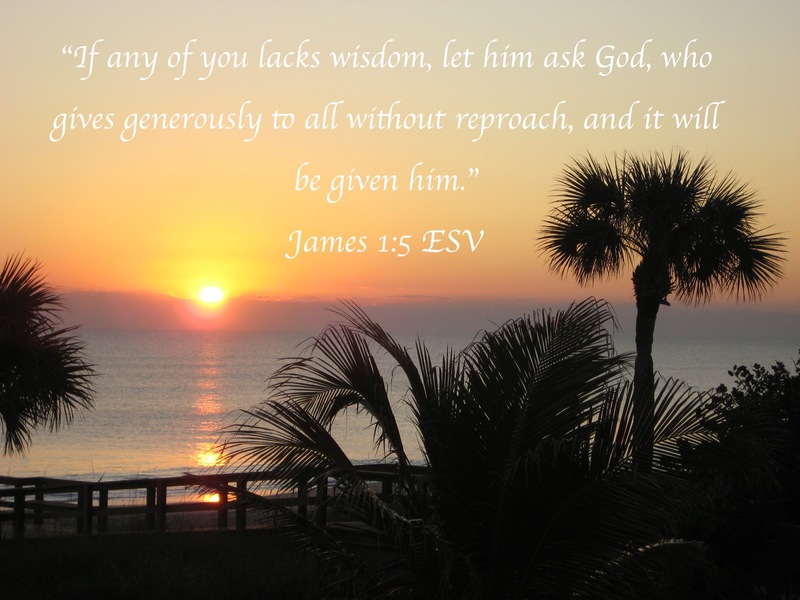 Certainly God knows we lack wisdom. He wants us to ask as a means of our humbling ourselves before Him. He knows we have a tendency to NOT ask. But it is good to ask. In relation to marriage we can take this idea of asking and humbling ourselves as a way to serve our spouse. We can’t expect them to automatically know what we need. Most likely your spouse doesn’t think like you do; I know mine doesn’t, and I have learned to thank God for our differences. It gives us a balance we wouldn’t have left to ourselves. So, why not plan a date night this week to talk about how you’re doing. And find out how your spouse is doing as well. Most importantly – be honest – you know it IS the best policy! Benjamin Franklin’s Birthday – Send your spouse a key attached to a string with this note, “In honor of Mr. Franklin’s birthday – let’s fly a kite together!” Plan a picnic and enjoy an afternoon date outside. Weather isn’t cooperating? Give them an IOU to use in the spring. Jazz Day – Have your favorite artist playing when your spouse comes home for the night. National Popcorn Day – Pop up your favorite variety at home, or plan a date at the movies to celebrate. Archery Day – Take your spouse to a shooting range to learn this ancient use of weaponry. Not a range around where you live? Watch one of the epic movies where archery is on full display. Cheese Day – Invite a few couples over for a Wine and Cheese party. Or enjoy three varieties yourself. Basketball Day – This is a good excuse to spend an evening watching The Orlando Magic as they play the Lakers at 8p. ET, on ESPN. National Blonde Brownie Day – Yes, you are allowed to indulge today! Enjoy!! >Winter Park – Jan. 16, 2012 – Martin Luther King Jr., Day Symbolic Program. >Sanford – Jan. 16, 2012 – Martin Luther King Parade begins at 10 am on 13th Street to Holly Ave, to 9th Street then to Coastline Park. >Sanford – Jan. 16, 2012 – Martin Luther King Rally-in-the-Park. Community function with live entertainment, food and games starting at Fort Mellon Park in Sanford starts at noon. Shady Park at Hannibal Square after the parade. >Bok Tower Gardens – Jan. 16, 2012 – Martin Luther King Jr. Birthday Concerts. Music of hope, inspiration and peace to honor Dr. King. Included with paid admission. >“The Help” Movie and Dialogue – Jan. 17, 2012 – Free admission at the Bush Auditorium, Rollins College beginning at 6:00pm. Facilitated discussion after the movie. Winter Park – Camellia Show and Festival on Saturday, January 21st at beautiful Mead Gardens from 10a – 4p. FREE. Eatonville – The 23rd annual Zora Festival begins on Saturday, January 21st and runs through the 29th. See site for times, locations and details. Winter Park – Music at the Casa continues on Sunday, January 22nd from 12p – 3p. FREE. This week’s featured artist is harpist, Christine MacPhail. Mt. Dora – Renninger’s Antique Extravaganza – Friday thru Sunday, January 20th – 22nd. This happens only three times a year – a great date day! See site for times and prices. Clermont – Lakeridge Winery presents the Winter Music Series on Saturday, January 21st from 1p – 4p. FREE. Downtown Winter Garden – Fridays on the Plaza features live music playing in the city’s gazebo from 7p – 9p. Check out JR’s Attic Door for a great place for dessert and coffee after dinner. This entry was posted in Christian Marriage, communication, Date Night Ideas, Growing Strong Marriages, Mark Your Calendars (time sensitive), Orlando Date Ideas and tagged Benjamin Franklin, Bok Tower Gardens, date nights, Fun Dates, God, Honesty in Relationships, King, Martin Luther King, Martin Luther King Day, Orlando Magic, Rollins College. Bookmark the permalink. 5 Responses to How Are You? I like your thought process. When reading the 1st paragraph I thought to myself but I am usually fine. I am blessed in this life and learning to count it all joy. But I do need to be more open to my husband about what I am feeling and thinking. But I’m also a girl who will take any excuse for a fun date with my hubby so combining the two will be fun. I love your enthusiasm, Shawn. I think we could call these kinds of dates – our double duty date! What do you think? Great perspective. Thanks for bringing this to us. I like Shawn, will use this idea to bring better communication with my husband. I’ve started to try to be the first one he sees when he comes home, so these little things will just keep adding up. Thanks again. I vote you both tell each other first. As soon as you’ve sat down for dinner (assuming you’ve either said your blessing before the meal or wait until you’re done eating). The first order of business- no waiting for the question. Each person gets 2 minutes to state the highlights or questions for the day.